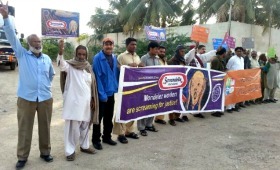 The Cadbury (Mondelez) union, an affiliate of the Pakistan Food Workers Federation has been trying to re-negotiate their collective agreement for the past 20 months. At stake is the union’s determination to win permanent jobs for precarious workers and the company’s refusal to negotiate over this issue. While meetings between the union and Mondelez management occurred in December last year, the company refused to talk about the status of contract workers, refused to sign minutes of the meetings and withheld information crucial for negotiation. In the latest protest at the factory gate on January 13 the union’s officers and members demonstrated their commitment to continue the struggle on behalf of contract workers.